In a large mixing bowl, combine flour, sugar, salt and paprika. Add small pieces of cold butter. With electric beaters, blend butter and flour mixture together. (If mixing by hand, combine dry ingredients then cut in butter with a pastry blender or two forks.) Add water and vanilla. Mix well. Dough should begin forming into a ball. If necessary, add a little more water to bind. Divide the mixture in half and form into balls. On a lightly floured surface or piece of parchment paper, roll out the dough as thinly as possible, about 1/16th of an inch. Sprinkle with sea salt or other desired seasonings. Cut into 1 inch squares and place on a baking sheet lined with parchment paper. Bake at 400 degrees for about 7-8 minutes or until browned and crisp. (For extra crispy wheat thins, turn oven off and let wheat thins stay in oven for 2 hours or until oven cools down. When completely cooled, store in an airtight container at room temperature. Recipe makes about 5 dozen pieces. In a food processor, combine chickpeas with the liquid, garlic, lemon juice and sesame tahini. Puree to a thick paste. Scrape down sides. Add olive oil, salt and paprika and puree until smooth and creamy. Spoon into serving dish. Drizzle with olive oil and garnish with parsley. Serve with crackers, pita chips or crudités. 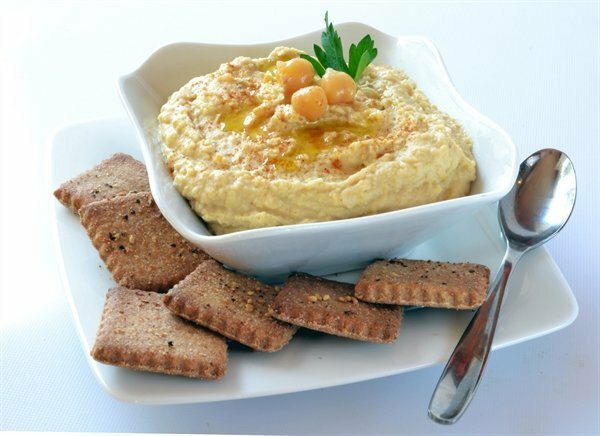 The hummus can be refrigerated for up to 5 days. Makes about 1½ cups.